This applies to SOLO only ! • Limited to Ten continuous rolls, before changing to another continuous roll. Novice/Beginner performs Solo, Basic Strut in box pattern, and Showtwirl/Freestyle. Intermediate/Advance/College performs Solo, Two Baton and Showtwirl/Freestyle. Your Solo determines the level you enter. All scores will be combined to determine the overall champion. In case of a tie, the Solo score will determine the winner. Novice/Beginner performs Best Appearing with no interview or baton, Basic Strut in box pattern and Solo. Intermediate/Advance/College performs Best Appearing with no interview or baton, Fancy “X” strut and Solo. Your Solo determines the level you enter. All scores will be combined to determine the overall champion. In case of a tie, the Solo score will determine the winner. Perform Best Appearing with no interview or baton and Basic and Military Strut. The Basic and Military portion will be done “back to back” in same lane and in front of the same judge. Your Basic Strut determines the level you enter. Both scores will be combined to determine the overall champion. Awards may be changed at any given competition due to size. This is at the discretion of the contest director. Perform to music of choice. A routine consisting of one or multiple batons that portrays a feeling or interprets a thematic or character style approach to the selected music of the competitor's choice. Gymnastics permitted. Timing starts when music starts. NO props or other twirling apparatus (Disqualification if prop(s) utilized) Flag and Hoop baton is considered a prop. Challenger Cup routine: 2:30 minutes maximum - Perform to standard march music in a designated lane. Hall of Fame Solo: 2:30 minutes maximum - Perform to standard march music in a designated lane. Military - Square pattern/box. Judged on score sheet, military beat or variation. Basic - Square pattern/box. Judged on score sheet. Basic arm swing. Solo - Routine utilizing one baton, salute or pose, depending on organziation rules, gymnastics permitted or "not permitted" per organization rules. Teams MUST consist of 4 or more members! Gymnastics are allowed in team routines. Props are allowed in team routines, except Twirling Team. A team routine with one or multiple batons or props per member choreographing baton and dance movements that are both stationary and traveling with creativity and originality. 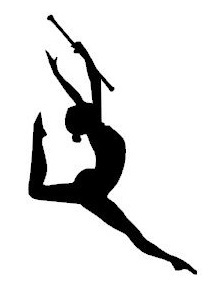 The routine should incorporate variety and difficulty of dance and baton with perfect unison while performing with emotional character, projection, and enthusiasm. Group and partner sequences, floor coverage, patterns, alignments, spacing, and dynamic effects should all be incorporated elements with proper technique. This choreography should be the artistic explanation of your music creating a theme. Style should be created throughout routine with baton, dance and costuming. Music should be appropriate for age. A team routine with one baton per member incorporating variety and difficulty of baton movements with a balance of partner and group exchanges, floor coverage and patterns, dynamic effects with a creative style. Standard march music will be utilized and appearance/costuming should reflect choice. Projection, technique, and unison should be maintained throughout performance. NO PROPS. A team routine incorporating baton and/or small props to portray a feeling or act out a thematic or character style to chosen music. Group and partner sequences, floor coverage and patterns, alignment and spacing along with originality and creativity are part of the routine. A team routine that is choreographed with dance movements that emphasize uniformity and utilization of pom pons for maximum visual effect. Music is usually a fast tempo to create energy and enthusiasm related to poms. A group of 10 or more members utilizing batons, props and backdrops. Choreography of baton and props with dance movements and maneuvering that are both stationary and traveling with creativity and originality. This choreography should be the artistic explanation of your music creating a theme. Style should be created throughout routine with baton, props, dance and costuming. A group of 10 or more members performing a parade style routine. Any formation is acceptable. 1. Please call or email the Contest Director if you have any questions or need clarification on any event or rule. 2. The Contest Director or hosting facility will not be responsible for participant or spectator injury traveling to/from or while at the event, nor will it be held responsibile for lost, stolen or damanged property belonging to individuals. 3. Late entries will be returned if postmarked after the deadline date. 4. No video taping of other twirlers or groups will be allowed. If there are any complaints, camera will be removed. 5. The contest will start promptly at 8:30 a.m. with facility doors opening at 7:30 a.m.
6. If you miss a division that you are to perform in while at the contest, the lane and division/event will not be re-opened. 7. Absolutely NO refunds are given. 8. No phone entries or email entries will be accepted, under any circumstances. 9. Any returned check will be charged a $25 fee in addition to amount owing. 10. All contestants in Championship events will be able to view all competitor scores on the internet at the Twirltacular "results" page. 11. Since the Championship and team events are not divided by organization, gymnastic moves will be allowed in any routine. 12. All organization rules, score sheets and judges will be used and followed on all OPEN events. All judges are qualified and briefed on all organization rules and standards. 13. The decision of all judges will be FINAL. Any discrepancy in scoring will be addressed by the contest director to the judge in question. 14. Judges are NOT to be approached at any time during the contest. 15. TWIRLTACULAR competitions provide ALL twirlers from ALL organizations a “UNITY” atmosphere. Determining Status Level of Championship Events is listed below. This applies to Twirltacular, Solo Champ and Majorette Queen. Novice: No more than three (3) 1st place wins in Solo. Beginner: No more than five (5) 1st place wins in Solo. Intermediate: No more than nine (9) 1st place wins in Solo. Advance/College: 10 wins or more in Solo. Twirltacular Rule: TWIRLTACULAR COMPETITION WINS WITH NO COMPETITORS IN SAID DIVISION, DO NOT COUNT TOWARDS ADVANCEMENT. Routine performed by 2 persons with 1 baton each incorporating exchanges and teamwork. Salute or pose and gymnastics permitted. Perform to standard march music in a lane. Routine performed by 3 persons with 1 baton each incorporating exchanges and teamwork. Salute or pose and gymnastics permitted. Perform to standard march music in a lane. Routine utilizing 2 batons with continuous movement of both batons at all times. Salute or pose and gymnastics permitted. Routine utilizing 3 batons with continuous movement of all batons at all times. Salute or pose and gymnastics permitted. - Intermediate/Advance/Elite/Collegiate (perform model in costume/no baton/no interview) “T” pattern preferred. Best Appearing, Strut (X/L/Straight) and Solo with 1 baton. 10:00 min max - A group of 10 or more members utilizing batons, props and backdrops. Choreography of baton and props with dance movements and maneuvering that are both stationary and traveling with creativity and originality. This choreography should be the artistic explanation of your music creating a theme. Style should be created throughout routine with baton, props, dance and costuming. Copyright © 2019, Twirltacular Grand Championships. All rights reserved.